I am a first grade teacher on a scientific research team deployed at Palmer Station, Antarctica. We are here studying a wingless fly called Belgica antarctica. It is the southernmost, free-living insect in Antarctica and it's the largest animal that remains on land throughout the year. 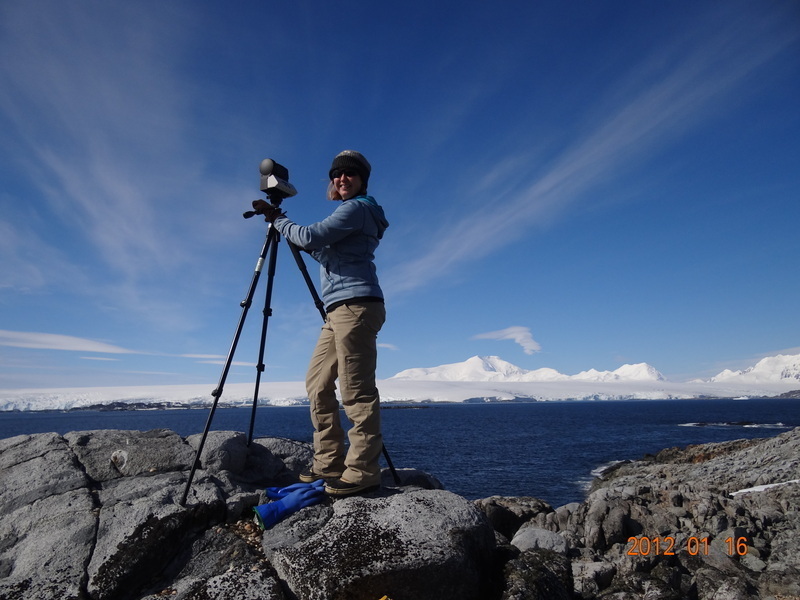 As the team's educational outreach coordinator, I used Gigapan technology to connect students in my school district as well as nationally with scientific research taking place at the bottom of the world. Antarctic Gigapan images can be found on my team's outreach blog at www.crestwoodexplorestheworld.org along with descriptive information and scavenger hunt challenges. Gigapan gives (preschool-grade 12) students an opportunity to explore detailed images of the Antarctic environment, provoking thoughtful questions and higher levels of learning. 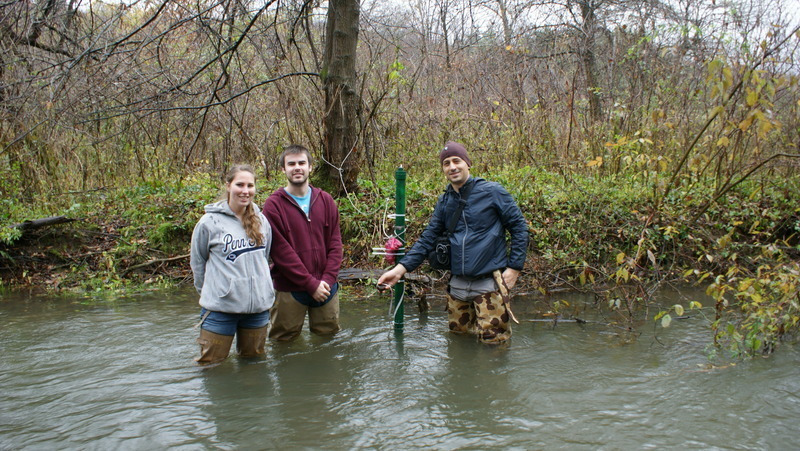 On Thursday December 8, CREATE supported the Pittsburgh Parks Conservancy to pilot their first WaterBot in Frick Park. The Parks hope to use it to monitor CSO (combined sewage overflow) from nearby storm drains that have long been a concern in the 9-mile run watershed. The Parks will use WaterBot as part of their service learning programs, in which youth participate as eco-stewards and volunteer time to clean up the streams. The weatherproof Bot is secured to a t-post in the ground and the sensor, attached to a cable, floats in the stream, collecting data every 15 minutes. We look forward to growing the pilot program in the Spring! After a short picnic of cookies and hot chocolate, Taiji Nelson wades into the creek to determine the best monitoring spot: somewhere the Bot could be concealed to prevent tampering, but also get the most accurate readings. Below, Taiji and Max Buevich from CREATE Lab drive the t-post into the stream bed. A successful installation - the netbook is already picking up data transmitted from WaterBot! We invite you to participate in the second Nearby Nature GigaBlitz. We urge you to start thinking about possible subjects close to your home, school or work, and then during the solstice week of December 19 – 25 get out and gigapan local animals and plants in all their biodiversity. We would especially encourage prior entrants to re-visit the settings they recorded during the June 2011 gigablitz. In our inaugural GigaBlitz this past June, we expressed our hope that Nearby Nature gigablitzes would “help the GigaPan community more deeply explore, document, and celebrate the diversity of life forms in their local habitats.” You responded with over 70 amazing gigapixel images, and countless snapshots. Our jury looked closely at all of them, wishing each could be held up as shining examples of biodiversity in everyday places. In the end, 8 fascinating entries – each brimming with life – were chosen as best representing the Nearby Nature premise. These are profiled in the November 2011 issue of GigaPan Magazine. CREATE pilots Waterbot with Loyalhanna Watershed Association! WaterBot is a citizen scientist project that prototypes a low-cost, easy and mobile method to monitor small streams. 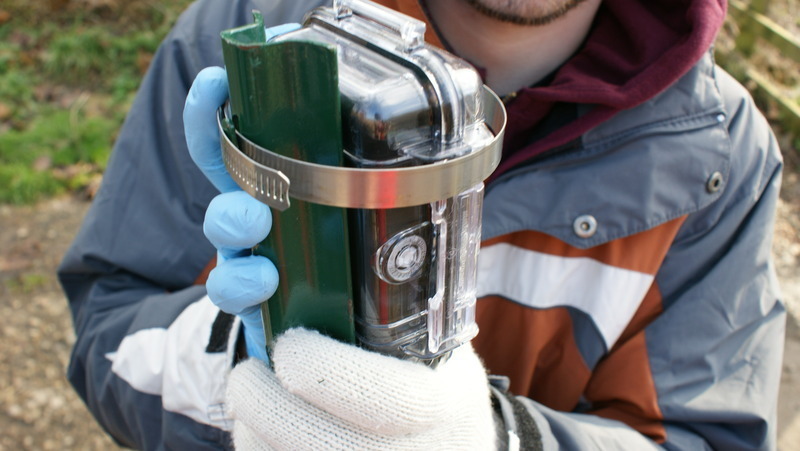 The water-sensing bot measures temperature and conductivity as indirect measurements of Total Dissolved Solids, indicating changes in water quality. The data is transmitted from the bot and automatically uploaded to waterbot.org in real-time with the goal of empowering communities, educators and kids to monitor and log the effects of industry and pollution on their watershed systems. Josh Penatzer and LWA share their expertise in placing sensors and best practices for installing sensors to avoid damage from wind, ice and animals. The CREATE Lab is excited to use these methods in the future to share cheap water monitoring technology. A huge thanks to Josh and the Loyalhanna Watershed Association for all their work! Look for more information about Waterbot pilot programs and availability in the future. 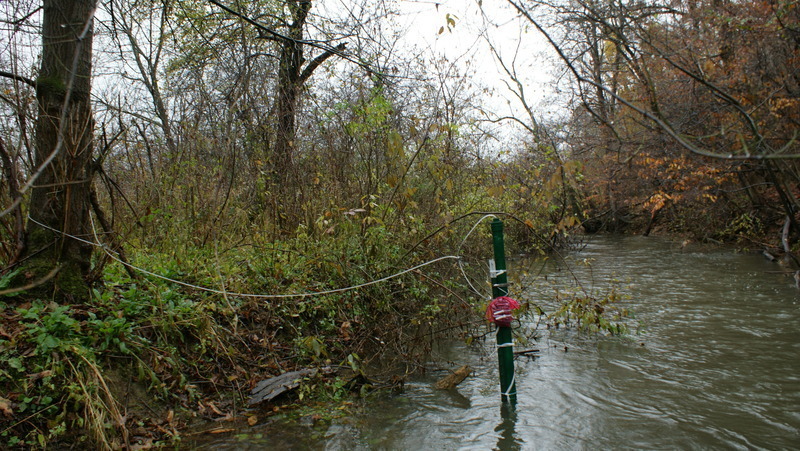 A T-post installed in the stream bed is a stable way to install a water-sensor. The post is tether to a tree or other object with a coated steel cable. 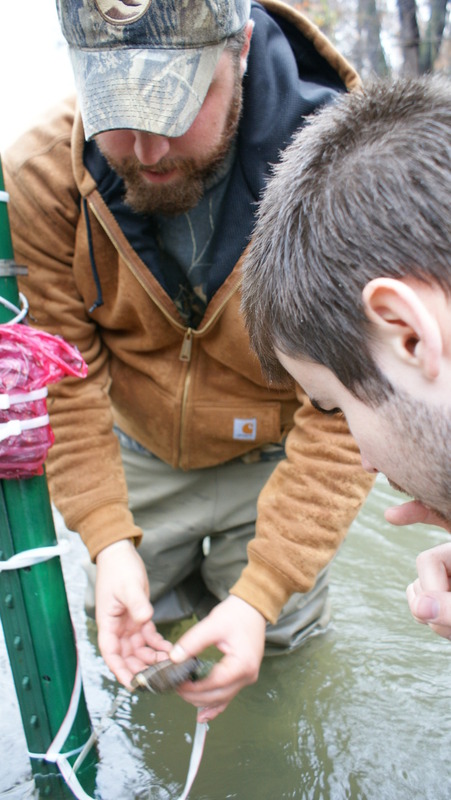 The sensor extends from the bot, wrapped in plastic to shield it from the elements, into the stream where it gathers temperature and conductivity data. Josh of the LWA demonstrates methods for gathering data from sensors in streams with Max. Right, the Waterbot sensor is weighed down and suspended in the water. The CREATE team with Josh's sensor post - Jessica P., Max and Dror! I am a member of the CREATE lab at Carnegie Mellon University (http://createlab.ri.cmu.edu/). We place robots and sensors in communities to help people better understand (and hopefully empower them to do something about) their environment. We are involved in the development of the public health project described below, currently going after funding. This is how I got to take home some air sensors to play with. Since this project is about awareness, I decided to share my findings with others as I go. DOOR TO DOOR (DTD) was conceptualized in collaboration with the Group Against Smog and Air Pollution (GASP), a non profit local organization with 40 years of experience working to reduce air pollution in the Pittsburgh areaand the CREATE laboratory of Carnegie Mellon, an organization that conducts community projects in Braddock. a) assess exposure of asthmatic children to fine particulate matter and traffic emissions. b) to reduce the exposure level and health burden associated with these pollutants.